Birmingham Airport – where’s that then? As somebody with no sense of direction, I rely completely on road signs and, when its working the satnav. When it’s working is the operative word here as, last weekend, I had to use one route I haven’t used for nearly 4 years and then very infrequently and another I’ve never used before. I’ve been moaning about the first route, Birmingham Airport for years now, not because it’s a really boring journey, once you’re on the A14 followed by the M6 and the M42, even though it is, but because of the hopeless road signs. Unless you are very familiar with, or have a good memory for it, the bit where the M6 splits off into the M42, is the first time you’ll get any indication that Birmingham actually has an airport. Actually, let me correct that, because if you take the time to look at the photos in the attached PDF, you’ll notice that all that is shown on the road signs is an aeroplane symbol and nothing else. Clearly the Highways Agency didn’t like Birmingham Airport anymore than I do and swore to protect people from its outrageous parking charges, by making all road signs to it vague and unhelpful. The alternative of course, is that once they’d made the signs, they couldn’t fit Birmingham on, next to the little aeroplane, so decided it would okay to let people work it out for themselves, as they charged along their high speed roads, darting from lane to lane, desperately wondering which one they should be in. They also decided, whilst they were at it, to make those unfamiliar with these hostile roads, guess which direction they should be going in on the M42 north, or south. 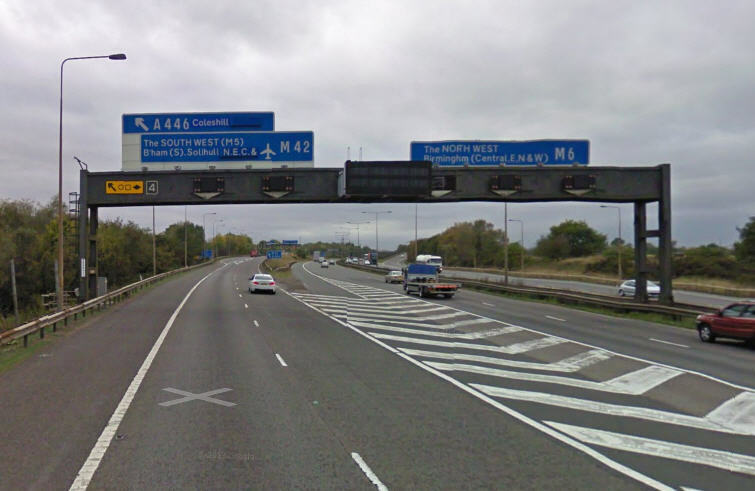 To achieve this jolly jape, they first signpost M42(S) and then follow this up with a simple M42 on the next signage. This wheeze means that just as the motorist is beginning to panic, thinking that they have somehow switched from the M42(S) to the M42 (neither) and therefore needs to throw their car, complete with passengers, in to the left hand lane, in order to exit the motorway as soon as possible, another sign appears referring to the M42(S) again. Oh what fun they must have in CCTV control, watching unsuspecting drivers swerving from one side of the motorway to the other as signs confuse, lanes switch and the symbol for Airport appears one overhead gantry too late to avoid the need to swerve across the, ‘Don’t drive on here, on pain of death!’ road hatching. Finally, in the best practice of contrast and compare – or is the other way around? I can never remember – I included two sample photos, for the route to Stansted Airport. Not only is this well signposted all the way from the A14, M11 and the airport itself, it actually says ‘Stansted’ next to the cute little picture of an aeroplane. Of course this could simply mean that this particular set of roadsign wizards haven’t been to Stansted Airport and therefore do not feel duty bound to protect the travelling public from its horrors! just in case you can’t contain yourself and need to see what I’m on about, without opening the PDF, the photo below is of the first overhead gantry to acknowledge that Birmingham even has an airport. You can guess what many drivers do if they’re in the right hand lanes when they first spot it. Incidentally, I’m not so completely sad that I felt the need to construct the attached photo montage for the sake of it, it’s been attached to an email I’ve sent to the Highways Agency this afternoon. Do you think write back telling me to buy a map, or a satnav that works? Why has Wygate Park got those useless buildouts? The title doesn’t reflect my view by the way, but is a question sometimes asked of me by residents and drivers using the road named Wygate Park. As an aside, I think that’s a terrible name for the road, as it seems to cause no end of confusion for people, even those who have lived around this area for sometime. As well as being the name used to describe the area of new development that was created off of the long established Woolram Wygate, Wygate Park partially shares its name with another long established road off of Woolram Wygate, Wygate Road. Is it any wonder that people get confused dot com? Anyway, I digress, back to the subject of this entry, the ‘cursed’ buildouts. These buildouts were installed in response to the increasing concerns of certain residents and the councillors representing the newly formed Spalding Wygate ward, on South Holland District Council. I have the honour of being one of those councillors and I make no apology for being partly responsible for this less than perfect traffic calming scheme. Now for a bit of ancient history, as what was told to me, in days gone by. Long before I even knew there was such a place as Spalding, let alone an area called Wygate Park, the chap who was the other district councillor for this area, was taking a very active interest in all things political. Prior to becoming a district councillor, he had had a conversation with a member of the county council’s highways team responsible for planning, along with the developers, the roads in, around and through Wygate Park. Apparently, the road now called Wygate Park was seen as a golden opportunity to create a defacto western relief road for Spalding and all at the expense of the private sector. 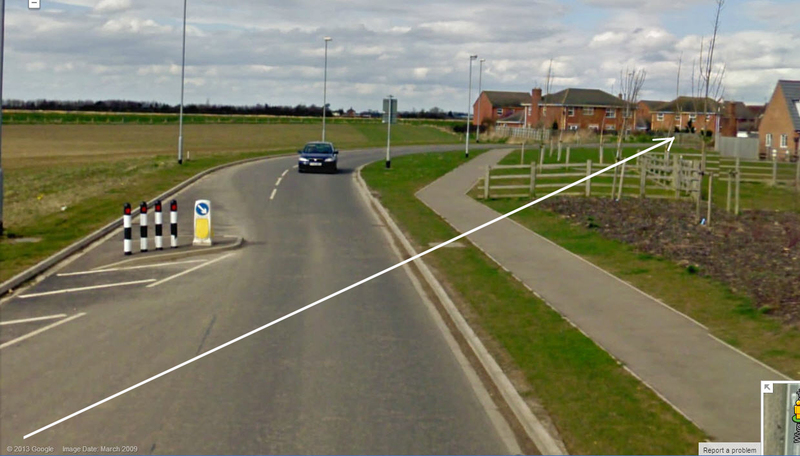 When I first moved to Spalding, having been posted back from Cyprus by the RAF, I was baffled by both the width and straightness of a road supposedly intended to serve a totally residential area. 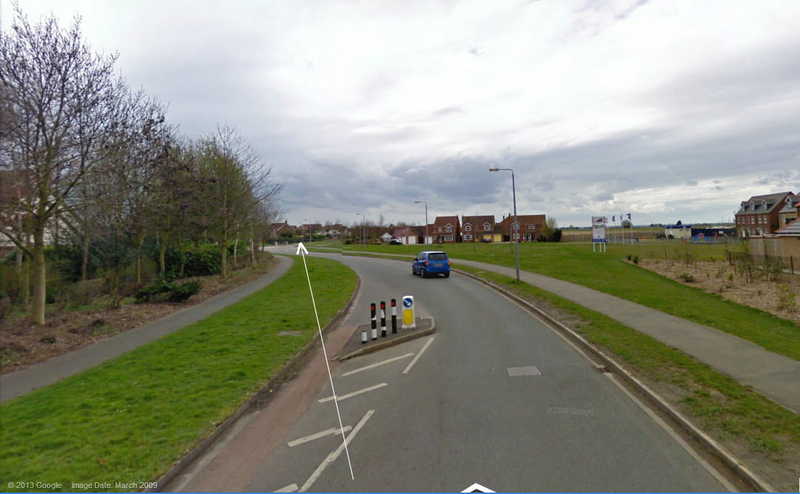 I very quickly came to realise that, once finished and opened all the way through to Monks House Lane – we were living off of what was believed to be the largest cul-de-sac in England at the time, 540 houses with only one road in and out – speeding would quickly become an issue. Incidentally, despite my concerns, a recent survey by the Lincolnshire Road Safety Partnership, suggests that the average speed on this road is actually 24 mph! Not for the first time has this exact same figure been quoted to me following a traffic speed survey on another road, something I find slightly suspicious. Once I became a district councillor, I made a point of voicing my concerns about the design of this road, as often as possible. Hindsight is a wonderful thing I know, but who in their right mind would plan a housing development the size of Wygate Park, on the wrong side of an archaic level crossing and then stick the equivalent of the A1 through the middle of it? To make matters worse and possibly because the county council had realised the potential for speeding on such a straight, wide and open-sided road, some totally useless, but very expensive block paviour platforms were added, supposedly as some form of – you’ve guessed it – traffic calming! Not only are these platforms useless as a traffic calming measure – I’ve yet to see anybody slow down for them – they also generate an inordinate amount of tyre noise, as cars enter and and exit them at speed. I can only describe it as a sort of cracking sound. Having mounted a platform, often at speeds in excess of 30mph (notwithstanding the survey!) a loud buzzing noise can be heard again, from the cars’ tyres as they speed across the joints in the block paving. So, with all these negatives in mind and having seen the impact a busy, fast moving road can have when it’s carved through a residential area, I was determined to do something about it, which brings us nicely back to the buildouts. With all due respect to the very genuine concerns some drivers have for their own safety whilst negotiating these buildout, it’s not the buildouts that are at fault, its the drivers. Taking the one near to the Co-op shop, just along from Mariette Way first. I regularly hear drivers complaining that it is dangerous, because you can’t see what’s coming the other way until you are on the wrong side of the road – sorry folks, you’re wrong. In the image below, using Google Maps street view, I’ve captured, as best I can, the view a driver sees as they approach the buildout. As you can see from the white line on the photo, by looking well ahead, you can see all the way along the right hand side of the road towards the pedestrian refuge near Claudette Ave and beyond. This of course is the same side oncoming drivers will be on as you approach this buildout. IF a driver approaches the buildout at the right speed AND if the driver takes note of the give way sign and line, then he or she will have plenty of time to stop and wait until the road is clear ahead. However, if the driver approaches the buildout with the clear intention of not stopping, come hell or high water, then they will of course find themselves making a split second decision – should I stop, or should I go. Now, because their approach speed was completely inappropriate, they will either find themselves slamming on the brakes, whilst at the same over shooting the give way line, leading to the need for an extreme piece of steering when they move off again or, actually needing to go even faster to get around the buildout, before then throwing the car back on to their side of the road, in order to avoid the on-coming vehicle! Of course, had they chosen the right approach speed in the first place, all this drama and stress could have been avoided. Of course you might be tempted to ask, ‘but what about the bloke coming the other way, what if they’re speeding, I’ve still got a problem. Not so; if you are driving at the right speed and looking far enough ahead, you will easily be able to assess the road conditions and respond accordingly. Pause for the insertion of an extract from a driving tips website, that reminds us of how we were all taught to negotiate a give way sign, all those years ago. Approach a give way junction using theMirror Signal Manoeuvre routine (MSM), or better still the MSPSL routine. This is expected by the driving examinerduring the driving test. To establish whether you need to stop or proceed without stopping, you must assess whether the junction is open or closed. A closed junction restricts your view of the road and traffic on the road you intend on joining, and open junction is clear to see and determine whether you must stop or proceed. See junctions for further information and a full explanation on open and closed junctions. Both give way and stop signs are regulatory order signs. The difference between give way and stop signs however is at a stop sign, a motorist must legally stop just before the stop line before proceeding. This is often due to the area that the motorist intends on entering is highly hazardous. Give way rules are different in that the driver must give way to traffic ahead but do not need to stop if it is determined that it is safe to proceed without doing so. The same situation applies at the other end towards Monks House Lane, although I will confess, this buildout is slightly trickier, because you can’t see quite as far, especially when the the driver that doesn’t know what the speedo is actually for, is coming the other way. In summary, those of you who fear for your life every time you enter Wygate Park and have to negotiate one of these buildouts, should think back to when you were learning to drive and try to remember the simple rule – a give way sign means, be prepared to stop. The problem with us all these days, is that we’re all in too much of hurry and far too ready to push our way through, even when the traffic lights are on red – but that’s a rant for another day. I’m sorry if this all sounds incredibly patronising and superior, but this is my blog page and if I can’t be an annoying know it all here, where can I be?